I had lunch today at TERI with Shivendra Sharma, formerly of PlaNet Finance and now Founder of Plural India, which will include a consulting group, foundation, and educational services for small, medium, and microenterprises. The purpose behind Plural is "to stimulate new markets by reducing information asymmetries and creating conditions conducive for open-market approaches to work in an inclusive manner." At PlaNet Finance India, Shivendra was the brainchild behind Small Change, the magazine dedicated to connecting microbusiness stakeholders globally and highlighting the diversity of the microeconomy. In December, Plural announced the first distance learning course in Microfinance, called "Microfinance Passport." Microfinance Passport is a four-month course for those interested in the emergent field of microfinance. You can learn more about the course by following the smart link above. The first series is now completely subscribed, but they'll be offering a second round in the summer. I'm heading to India today after 24 hours in Miami. Here in Miami we celebrated the new crop of Ashoka North America Fellows, leading social entrepreneurs from the US, Canada, and Mexico/Central America in the fields of social financial services, youth empowerment, the envrionment, and economic development. An awesome and insipiring crew. I am heading to India for a selection panel and to visit some of our environment-focused entrepreneurs over the next two weeks. I hope to continue my posts from that wired country, but I may be more sporadic than usual. I'm getting tired of the doomsday views being spouted about biofuels lately, as much as there's an element of truth to them. Yes, biofuels from food or dedicated crops aren't a sustainable strategy, and yes, biofuels from cellulosic ethanol may be years away before they become economical, but is this reason to completely abandon the idea? To call it a scam? I'm also a little perplexed that people talk about biofuel like we're pinning the climate's hopes on it, rather than as part of a much larger solution. Yes, we're seeing the hunt for palm oil sources devastating the rainforests of Indonesian. Bad. Bad. Bad. Makes for a great headline, eh? Does this suggest biofuels per se are bad or that we need to pay greater attention to how and where we get them? Is it not the government of Indonesia that's responsible for strictly regulating this domestic market? It's like saying we shouldn't use solar power because factories in China are using child labour. Solar isn't the problem -- it's the factory owners. Perhaps OECD countries should impose trade sanctions on any country that doesn't comply with strict environmental standards, as a recent BBC article suggests. A New York Times editorial at least sees the potential for biofuels, pointing out that it can be done if done responsibly. The same reasoning goes for the energy balance of biofuels. We've seen report after report saying that producing ethanol from corn takes more energy than what you get out of it, and that changing lands to biofuel crops releases carbon into the air. This might be the case in some circumstances, but there are some huge assumptions here about irrigation (water use), fertilizer use, transportation, and they are often analyzed out of context -- that is, not compared apples-to-apples to the way we go about exploring, producing, refinining and transporting oil. Again, regulation can deal with these issues. You think there isn't an army of scientists out there not trying to catalogue the best raw materials for producing biofuels, the best enzymes and bacteria for breaking them down, the best methods of transporting them, ways of growing on depleted lands, etc...? These are early days in the middle of a dramatic transition, and there are going to be some mistakes -- and much trial and error along the way. To suggest this isn't going to happen, and never happened in the early days of oil and coal, is simply naive. So let's stop demonizing biofuels. It's at times like these that I'm ashamed of my own industry for oversimplifying the debate with sensational headlines. But I digress. On a related note, I'd like to say I'm happy to see Richard Branson -- media stunts aside -- trying biofuels in airplanes. Virgin Fuels launched the world's first commercial flight powered by biofuel today and the company appears serious about studying the benefits and, based on that outcome, pursuing the biofuel option. Virgin contends biofuels could be a commercial reality in the airline industry within five years. Personally, I think this is an area we must aggressively pursue. In fact, I think we should devote most of our research and development on biofuels to their use in the airline sector. Here's my reason: We can't run planes on batteries, so electric planes aren't in the cards. We can run vehicles on electricity, starting with plug-in hybrids as a transition, and there is great momentum at the moment toward this goal. It's my belief that a biofuel industry devoted strictly to fuelling air travel could be done sustainably without having an impact on food prices and, as cellulosic approaches become more affordable, by depending heavily on agricultural and forest waste. Maybe I'm oversimplifying things, but it seems to me it makes more sense to target particular approaches to particular problems rather than have all approaches try to be all things to all industries. I hope Tyler doesn't mind my reblogging his post from Clean Break. It's such a Green Skeptic viewpoint, I thought my readers would appreciate it. Can we unleash the power of free markets to solve the problems of poverty, hunger, and climate change? This is a question we ask all the time at The Green Skeptic. We believe in the power of free markets and the most creative business models to address the most pressing problems of the day. Muhammad Yunus, founder of Grameen Bank, with which he pioneered microcredit and later received the Nobel Peace Prize, has written an engaging book that examines a new approach to purpose-driven business models: he calls it "social business." In Creating a World Without Poverty: Social Business and the Future of Capitalism Dr. Yunus sets out to map a new way of doing business and doing good. The social business concept is an outgrowth of Dr. Yunus's thinking that led to such projects as Grameen Phone, which is now the largest phone service provider in Bangladesh, the eye care hospitals Grameen is investing in, and Grameen Danone, a joint venture to produce and distribute affordable, fortified yogurt to malnourished children. Social business uses the value creation of profit-driven business models -- the business must meet genuine market needs and generate a profit -- but turns the profits back into further value creation or directly into the social purpose being addressed by the business. In Yunus's model, the original investors receive only an amount equal to their initial investment or even less. "Social business is the missing piece of the capitalist system," Yunus writes. "Introduction of it into the system may save the system by empowering it to address the overwhelming global concerns that now remain outside of mainstream business thinking." Driving profits back into the original purpose, where profits essentially stay with the company as opposed to being distributed to shareholders, allows for greater growth potential and expansion. This is where social businesses, as conceived by Yunus, differ from non-profits, which traditionally rely on philanthropic capital for growth and stability. I agree with Dr. Yunus that the traditional non-profit is an unsustainable model. "The social business dollar is much more powerful than the charity dollar," Yunus writes. "Whereas the charity dollar can be used only once, the social-business dollar recycles itself again and again, ad infinitum, to deliver benefits to more and more people." Where I differ with Yunus is in his assertion that a profit-maximizing company (PMC) can't also serve a social purpose. I understand the argument that PMCs are beholden to the shareholders first, and maximizing their return on investment is job one. This can clearly lead to some conflicts. But what if you are selective about your shareholders and state upfront that investors are allowed to take a small percentage of profits (say, 1-3 percent), and that the overage would be plowed back into the business for future value creation? Yes there may be pressure from shareholders to create maximum value for them, but is there a way to ensure that Values don't conflict with value? I'm not convinced it's as black and white as Yunus makes it; perhaps there's room for a little gray. Yunus is a consummate storyteller, as I've mentioned elsewhere on this blog. And even in the brief retelling of the Grameen story (necessary for those who haven't read his earlier book, Banker to the Poor), he captivates the reader. The stories lend a charm to what is otherwise a prescriptive book. He wants us to embrace the social business model and even offers some suggestions for how to get started. 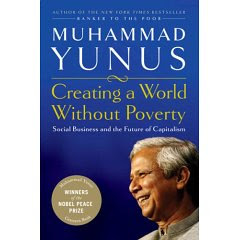 In the end, Yunus believes it "is possible to eliminate poverty from our world because it is not natural to human beings -- it is artificially imposed on them." He has dedicated himself to "putting poverty in the museums once and for all" and implores us to join him in the fight. "By defining 'entrepreneur' in a broader way we can change the character of capitalism radically, and solve many of the unresolved social and economic problems within the scope of the free market. Let us suppose an entrepreneur, instead of having a single source of motivation (such as maximizing profit), now has two sources of motivation, which are mutually exclusive, but equally compelling-- a) maximization of profit and b) doing good to people and the world." What a wonderful idea whose time has come. In Creating a World Without Poverty, Muhammad Yunus shows one path to realizing that vision. The Green Skeptic writes alot about clean tech solutions to addressing climate change and transforming energy. That's because I believe that a free-market technological approach -- we call it The New Green Economy -- has the strongest potential among a suite of approaches. It's an important component of a portfolio of responses. A year ago, I was in New York for a Climate Change Strategy meeting while working for The Nature Conservancy. I was not alone in noticing the irony in the fact that it was a warm day, the building's heating system was cranking, and we had to open the windows to regulate the temperature. How much energy was being wasted in that building and throughout that city. I wondered at the time whether retrofitting the HVAC infrastructure in cities around the world couldn't be a major contributor to reducing greenhouse gases. Now, Reuters reports on a new study from the McKinsey Global Institute (MGI) that says "squeezing more productivity out of the energy that industries, homes and vehicles burn is the most economical way to stifle rising energy demand and control output of planet-warming gases. "For decades, many countries have mostly invested in finding more supplies of oil, gas and coal to meet the rising energy needs of growing populations, but as energy costs and global warming concerns rise, interest in investing in ways to slow energy demand is beginning to take hold. "Slowing global energy waste at industries like pulp and paper, oil refining and steel, homes and cars could more than halve global energy demand growth from current levels of 2.2 percent a year, according to the report, "The Case for Investing in Energy Productivity," released by the MGI on Thursday at a United Nations Investor Summit on Climate Risk." Initial global investments would total about US$170 billion per year. But they would pay for themselves through energy savings, with an average internal return rate of 17 percent, the report said. Industries would need to invest about US$83 billion per year, homes would need to invest about $40 billion and transport and commercial sectors will need to invest $25 billion and $22 billion a year, respectively. Less burning of fossil fuels like coal, oil and natural gas as a result of the efficiencies would cut greenhouse gas output, the report said. Getting companies to change their energy habits, however, is no easy task. John Holdren, a climate expert at Harvard University, told investors efficiencies can be helpful in slowing global warming, but that much more needs to be done, such as developing new fuels and methods to bury carbon emissions, to stop catastrophic consequences such as flooding from rising seas. The bottom line: We need an expansive portfolio of solutions. Energy Efficiency should be one part of that portfolio. First Solar, Inc. (Nasdaq:FSLR) today announced its financial results for the fourth quarter and fiscal year ended, December 29, 2007. Quarterly revenues were $200.8 million, up from $159.0 million in the third quarter of fiscal 2007 and up from $52.7 million in the fourth quarter of fiscal 2006. Revenues for the fiscal year ended December 29, 2007 were $504.0 million, up from $135.0 million in fiscal year 2006. Net income for the fourth quarter of fiscal 2007 was $62.9 million or $0.77 per share on a fully diluted basis, compared to net income of $46.0 million or $0.58 per share on a fully diluted basis for the third quarter of fiscal 2007. Net income for the third quarter of fiscal 2007 included a one time tax benefit of $7.5 million, or $0.09 per fully diluted share due to the reversal of valuation allowances against previously established deferred tax assets in Germany. Net income for the fourth quarter of fiscal 2006 was $8.0 million or $0.11 per share on a fully diluted pro-forma basis. Net income for fiscal 2007 was $158.4 million or $2.03 per share on a fully diluted basis compared to net income of $4.0 million for fiscal 2006 or $0.05 per share on a fully diluted pro-forma basis. Pro-forma earnings per share for the three months and fiscal year ended, December 30, 2006, have been adjusted to give effect to the Company's equity offerings during 2006, including its initial public offering, as if each occurred on January 1, 2006. The Company believes the pro-forma earnings per share presentation represents a meaningful basis for the comparison of its current results to results during fiscal periods occurring prior to the Company's initial public offering. "During the fourth quarter of 2007 we benefited from the full capacity and economies of scale of our Frankfurt/Oder plant. This combined with continued throughput and conversion efficiency gains afforded us strong operating leverage and decreased our manufacturing cost per watt by 12% year over year to $1.12 per watt in the fourth quarter of 2007, further solidifying our cost leadership position in the industry," said Michael J. Ahearn, Chief Executive Officer of First Solar. GREENSKEPTIC NOTE: I continue to be impressed with First Solar's management. They are increasing ramp up on their Malaysia plant, are increasing conversion efficiencies, have long-term supply contracts with multiple suppliers for their primary inputs, and are realistic about the emerging competition while maintainming that their primary competition is with traditiomnal energy sources. Remains to be seen how the 4Q announcement will play out today, but the 77 cents per share beats the mean expectation of 53 cents, and that has been good for FSLR shares in the past. Pre-market is above 200. Clean Tech: Can First Solar Prove the Analysts Wrong...Again? First Solar (Nasdaq:FSLR) will release its 4Q report for the year ended December 29, 2007, tomorrow shortly after the sun rises. (The conference call is scheduled for Wednesday, 13 February 2008 at 6:00 AM MST (8:00 AM EST). Those of us who hold positions in the thin film solar manufacturer are eagerly awaiting the earnings report. Why? During the short life-span of the stock, First Solar has been an overachiever, consistently beating the predictions of market analysts. But that was before the steep dip back in January and, while it's been showing some signs of life again these past few days, it hasn't cracked $200 since January 16. This has researchers, analysts, and pundits wondering how the stock will perform in the wake of the earnings announcement. Andrea Kramer at Schaeffers Research asks, "Can FSLR keep up the trend of virtually laughing in the face of analysts? We'll see soon enough, as the company is slated to step into the earnings confessional before the market's open on Wednesday. This quarter, analysts are forecasting earnings-per-share of 53 cents on revenue of $179.48 million..."
"Should FSLR quarterly earnings perform the same way they always have, the chance for the stock's rebound back around its median target price is much more achievable than if earnings disappoint." Kramer wrote. "However, a weaker-than-expected earnings report could fuel analyst downgrades and price-target cuts – both potential catalysts lower." Meanwhile, on CNBC last night, the other Cramer, Mad Money's Jim Cramer, suggested "oil will go back up and he would pick up some more First Solar. First Solar is currently trading at $194.60, below its $283 high," according the StreetInsider.com. Down the street, David Gaffen at the Wall Street Journal, wonders if "investors may have had enough. The shares, which rose a ridiculous 795 percent in 2007, are down 29 percent in 2008, coming under a bit of pressure with the rest of the solar sector." But when taken in the context of alternative energy overall, FSLR and other solar plays may rise again. Over on the other side of the pond, Gunnar Millar, global co-head of Research Allianz Global Investors (AGI), told Reuters that "Alternative energy and solar energy are a very compelling growth opportunity and that's going to be a multi-decade phenomenon." "It's going to be something on a par with volume growth of flat panel screens, PCs and handy phones," he said, while adding some companies had become over-valued. He didn't name any names. And Thiemo Lang, senior portfolio manager at Sustainable Asset Management (SAM) was snapping up solar power stocks, saying last month's falls were an opportunity. He said he expected demand growth to outstrip capacity because of government support plus its tiny base now at less than 0.1 percent of the world's electricity. Broadpoint Capital also weighed in on First Solar specifically, saying they recommend sitting out the quarter due to excessively high investor expectations, but would be buyers on any weakness after results are announced. They expect strong results and guidance, but believe plans for an additional factory, a large 100MW+ system contract, or significantly higher 2008 guidance are necessary to move shares higher. Looks like FSLR closed @ 175 today; not quite the anticipatory uptick expected. Give me a wake up call before 8AM, please. Reuters reports that US carbon asset manager Natsource LLC has invested in the first forest-based greenhouse gas emissions reductions under California rules. Natsource paid a private owner of a redwood forest, the Van Eck Forest Project, in Humboldt County, California, represented by the nonprofit Pacific Forest Trust (PFT) for credits representing 60,000 tonnes of carbon emissions. The company declined to say how much it paid for the credits, but a source familiar with the deal said Natsource bought the credits for "well below" $10 per tonne. "The deal illustrates the significant role that management of existing forests can play in addressing climate change," according to a press release from PFT. "The transaction is the first commercial delivery of certified emissions reductions under the Forest Protocols adopted last fall by the California Air Resources Board (CARB). The Protocols represent the only rigorous governmental accounting standards in the US for climate projects embracing forest management and avoided deforestation, while ensuring emissions reductions are real, permanent, additional and verifiable. "Today marks a significant milestone for the recognition of the real benefits of conserving and managing U.S. forests to enhance their climate contributions," PFT president Laurie Wayburn said in a statement. "Investing in the power of forests to protect our climate is a practical action that can and should be taken now to reduce CO2 in our atmosphere. We are hoping that deals like this will provide policymakers around the world with the confidence they need to ensure that forestry becomes part of the solution to address climate change." CARB’s leadership in adopting the Forest Protocols is helping to stimulate a new asset class in global Green House Gas (GHG) emissions markets, validating forests as a cost-effective means to achieve real GHG reductions. used as a model to ensure that forests be used to achieve enduring benefits and become a solution in the fight against climate change. "Until now, forest sequestration has been an untapped asset in the effort to address climate change," said Jack Cogen, Chief Executive Officer of Natsource. "Forestry can and should be an important part of the portfolio of climate change solutions moving forward. This deal illustrates that when rigorous, clear rules are adopted, these investments can reduce costs for our compliance customers and provide what we believe are attractive investment opportunities. In voluntary carbon deals, such as this one, payments are made for carbon credits, which investors "store" for the day when US government regulates GHG. That will, in theory, drive up prices for the credits. Deals like this one are risky, however, as there is no guarantee the US will adopt a GHG regulatory scheme or whether they will recognize early actions. Critics of so-called "avoided deforestation" argue that it is difficult to prove whether landowners would have protected the forest or slowed its harvest without an incentive. Others argue that it is difficult to measure the CO2 sequestered by a standing forest, with trees at varying levels of maturity, compared to a newly forested area with faster growing younger tree species. Wayburn argues that paying the land owners to let the forest grow back more fully from the last time it was harvested is a valid option and will conform to the state's rules to ensure the reductions are verified. Meanwhile, Wayburn told Reuters, "The additional revenue stream allows forest owners to take a long-term harvesting strategy rather than a short-term strategy." Readers of this blog know that I'm a WB cynic (and I'm not talking the TV network). I'm not much of a fan of World Bank-directed solutions to the world's most pressing problems. If you haven't read White Man's Burden by William Easterly, you should, and you'll understand why. So perhaps that's why I'm not jumping for joy at the announcement on Friday that "poor countries will soon receive billions of dollars from a new World Bank fund to help them cut pollution, save energy and fight global warming." Industrialized (or post-industrialized?) countries like the US want developing countries to do their share to dramatically reducing their emissions. Developing countries want financial help to cut their growing emissions. And there's an obvious gulf between the two positions. I believe developing countries should be allowed to develop their economies without too much interference from the likes of us. That said, why should those same countries have to do it the old fashioned way? As with mobile phones and wireless networks, we should encourage developing countries to leapfrog tired, polluting and otherwise wasteful technologies for something better, cleaner, brighter -- and maintain their economic growth. If the World Bank fund focuses on supporting "publicly and privately financed projects that deploy technologies that can cut emissions, increase efficiency and save energy in developing countries," as the US, British, and Japanese finance ministers said in the Financial Times on Friday, then great. If it goes the way of other World Bank interventions, then we're in trouble. At least the WB seems to be learning from its mistakes. President Bush will cough up some of the US$2bn that he pledged last month to augment the World Bank clean technology fund, which will be combined with US$1.5bn more from the UK, and at least some of the US$10bn that Japan announced in January, according to Hank Paulson and his colleagues Alistair Darling and Fukushiro Nukaga. "Without moving growth on to a cleaner technology path, climate change could have a devastating impact on the world’s poorest and most vulnerable people," wrote the 3 Tenors of Finance in FT. "The fund will be an important step towards meeting the challenge of creating an environmentally sustainable path to prosperity." The World Bank says it will establish "a strategic climate investment facility that would accelerate and scale up low carbon and climate-resilient investments in developing countries." Let's hope the fund focuses on appropriate, local solutions for leapfrogging rather than the large-scale planning exercises we've come to expect from the WB. So much of the news around climate change just seems dire. I know, I see it roll across my Google News Reader every day. And it can get kind of depressing. As an investor and supporter of alternative energy, I am thrilled by the first bit of news. As a diver and lover of marine environments, I am delighted by the potential of the latter. First, when the top finance officials from the Group of Seven industrialized nations (G7) meet in Tokyo this Saturday, it appears that Japan, Britain, and the United States will propose a new fund promoting clean technologies to combat climate change. "The three countries will explain the content of their current discussions on the fund, and we'll see how the rest of the Group of Seven members react to it," a finance ministry official said on customary condition of anonymity. In addition to climate change, the G7 is expected to discuss the worsening global economic outlook and recent market turmoil, ahem, correction. Then Science Daily reported that "Natural processes may prevent oceans from warming beyond a certain point, helping protect some coral reefs from the impacts of climate change, new research finds. "The study, by scientists at the National Center for Atmospheric Research (NCAR) and Australian Institute of Marine Science (AIMS), finds evidence that an ocean 'thermostat' appears to be helping to regulate sea-surface temperatures in a biologically diverse region of the western Pacific." "Global warming is damaging many corals, but it appears to be bypassing certain reefs that support some of the greatest diversity of life on the planet," NCAR scientist Joan Kleypas says. "In essence, reefs that are already in hot water may be more protected from warming than reefs that are not. This is some rare hopeful news for these important ecosystems." Encouraging news in the International Year of the Reef 2008. Let's suit up and get wet until the market improves. Three years ago today I was diving here: Raja Ampat; some of the most amazing reefs I have ever seen. I'm dying to get back there. Last Wednesday, the Senate Finance Committee included measures to extend the Production Tax Credit (PTC) for renewable energy through the end of the 2009 in its version of an economic stimulus package originally proposed by President Bush. Under the Committee's bill, wind companies would receive a tax credit, currently 2 cents per kilowatt-hour of electricity generated, for each new wind turbine that goes into operation through 2009. The tax credit, which also would apply to electricity from solar, geothermal and other sources as well as energy-efficiency rebates, would cost approximately US$5.5 billion. The measures were introduced to the committee by Sen. Charles Grassley (R-Iowa). "Renewable energy production depends on investment," Grassley said. "Investors need certainty. They won't put their money out for a wind energy facility unless there's a reasonable expectation that tax incentives will continue into the future. For energy needs and for economic growth, we need to continue renewable energy provisions without interruption." The bill would also extend for one year a credit, equal to 30 percent of qualifying expenditures, for the purchase for qualified photovoltaic (PV) property and solar water heating property used exclusively for purposes other than heating swimming pools and hot tubs. The proposal extends the energy-efficient existing homes credit, extends the tax credit for the production of energy efficient appliances for two years, extends a credit to holders of clean renewable energy bonds, includes a deduction for energy-efficient commercial buildings, a credit for the construction of new energy-efficient homes and a credit for residential energy efficient property. It is being reported that the Finance Committee's version of the stimulus package bill may face opposition in the Senate and from the White House. The American Wind Energy Association (AWEA) applauded the Finance Committee bill. According to AWEA Executive Director Randall Swisher, the bill will be a benefit to wind industry. "The extension of the production tax credit (PTC) is urgently needed to protect tens of thousands of U.S. manufacturing and construction jobs and create tens of thousands more, and to keep investment flowing into one of the fastest-growing and brightest sectors of our economy: renewable electricity," Swisher said. "We urge the full U.S. Senate to move quickly to adopt the Finance Committee stimulus package that includes the PTC extension," Swisher continued. "Rapid action is pivotal if wind, solar and other renewable energy industries are to continue to grow, attract large-scale manufacturing investment and create jobs for Americans across the country."